Gold Coast or Sunshine Coast? Brisbane city is located right in the middle of some of the best white sandy beaches in the world - we are so lucky to have the Sunshine Coast only an hour's drive to the north, and the Gold Coast only an hour's drive to the south. Which do you prefer? Do you drive north or south to get your fix at the beach? Do you have a favorite beach for an afternoon getaway, or a weekend of surfing? Maybe you just follow the surf report? Given the choice I'll always head north; it's better all round. I find the Gold Coast trashy and over-developed. If you have the time heading further south past the Gold Coast to Northern NSW makes for a beautiful day trip, Brunswick Heads is one of my favourite destinations. For families with kids: To the north - Noosaville is a quiet spot on the Noosa river, with easy parking, playgrounds and plenty of food options. To the south - Tallebudgera Creek is a beautiful natural spot for families, with Burleigh Heads nearby for supplies. I have a preference for the Gold Coast, mostly for its variety. Now don't get me wrong, I love the sunshine coast. Lots of friendly laid back people, great beaches, great food and cafes, lovely walks and towns in the Hinterland and just a generally laid back atmosphere. 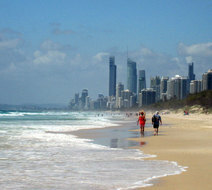 However the Gold Coast is often maligned by people who visit only a small section of it. 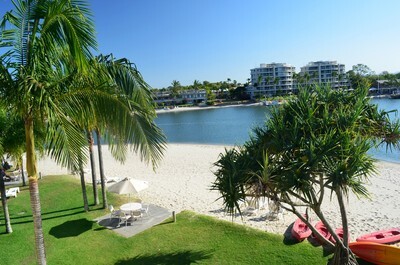 On the Gold Coast you will probably find something that is right for you. There is of course Surfer's Paradise where you can choose between over priced meals or really cheap eats aimed at Backpackers ($2 for a slice of pizza is great value). There are night clubs, pumping bars and tourist attractions everywhere. North of this is South Port. Now I love South Port because I cycled through the coastal bushland here. This area has a locals only vibe that will probably be lost when they bulldoze the bushland for some mega resort, but for now it is a lovely stretch of little visited beach and at the spit is a lovely fish & chip shop and good fishing. South Port is also home to many of the Gold Coasts theme parks, which is great if you have kids or this is what you are into. Going further south there is Broadbeach. I used to love broadbeach but I think our love affair is coming to an end. Home to the Casino which is a little run down compared with newer developments around Australia and in Asia, but still often has good music and shows. But what I loved about Broadbeach was the dining. However many of the great restaurants are being replaced with the generic over priced items you see in Surfers Paradise, but still there are some lovely cafes there. Burleigh Heads now has the reputation for great dining, though I am basing this on what my friends have told me as I have visited the beach there but not dined. Currumbin has the reputation of a family friend place with two estuaries suitable for kids to go and play in. There is also the zoo. Now heading further south in Coolangatta we enter bogan country, but the nicest loveliest bogans in all of Australia. Then you go over the border to Tweed Heads where they are so desperate to not be like Gold Coast people you get a sudden shift up in snootiness, but in a lovely Sunshine Coast way. Then the Gold Coast Hinterland features such amazing places such as Lamington National Park and Mt Tamborine. Not only that, the Gold Coast overall has much more energy. From free music festivals in Broadbeach or art exhibitions on the beach, it is as if something is always happening. It is strange to think that you travel from Brisbane, a business city, to the coast to move up in pace not down. For a weekend away I would go to the Sunshine Coast, especially if I was looking to get back to nature, but for a weeks holiday I will always prefer the Gold Coast because of the variety. I can remember the days of running down the sandhills at Sufferers' Paradise. I can remember a poem written in the 'sixties which contained the lines "at Noosa Heads the breakers roll along a clean white stretch of sand". Then along came the developers. I now travel a little further north to the comparatively unspoiled Teewah Village on Noosa North Shore and give my children and grandchildren a taste of how beach going used to be. OK, so you need a 4WD to get there, but it is a small price to pay for access to glorious early morning walks along the beach and in the adjacent unspoilt bushland. Where is Brisbane's best pool?